Brittany’s owner told me that she “was a special little dog that never quite trusted the world.” When she was adopted at nine months of age, she spent the first two weeks hiding. Her family spent a lot of time lying on the floor, gently trying to coax her out from underneath the bed. She was always shy around strangers, but became an incredible companion to her family and loved them unconditionally. Morning walks and cuddling were moments she enjoyed most of all. 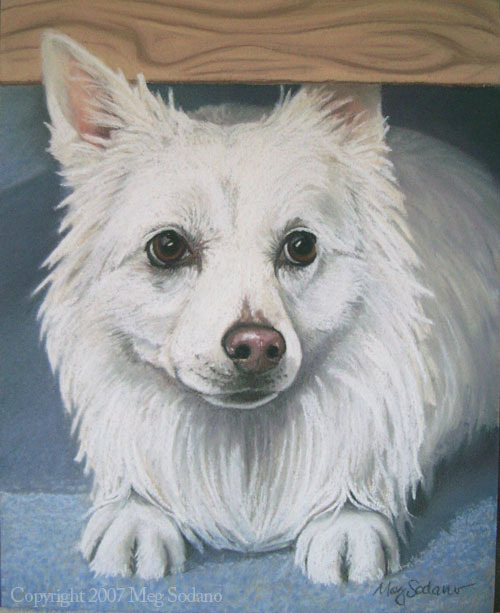 I wanted this portrait to emphasize her sweet personality and her soft, fluffy, white coat. Her position under the bed not only illustrates her early timid behavior, but helps reflect her petite size.